“We Need A Ride” – Black Eyed Kids In New York! Here is another Black Eyed kid encounter – this time In New York where a couple are told the need a ride in their car. I was on a date with my fiancé, who is now my husband, one night in 1985. This took place in New York City. Both my husband and I are lifelong New Yorkers. My husband is an accountant and I am a retired teacher. We were going to out to dinner, and had just pulled over near to a restaurant we used to frequent quite a lot. As my husband parked the car outside the restaurant we both heard someone knock their knuckles against the car window. Which is unusual as there is normally a doorman at this restaurant to dissuade that sort of thing. We both looked over and saw two teenage boys, in hoods standing outside our car. I immediately felt fear like I’ve never felt it before. My hands were shaking without any reason to shake. I was instantly petrified. The two boys were pale, from what I could see, and looked completely stoned. My immediate reaction was to leave, but my husband didn’t want to leave without dinner. My husband opened the car door and the two boys stood back to let him out. He was just going to ignore them and go into the restaurant. I opened the door on my side of the car and got out too. When I turned around I looked at the two boys and in the dim street light they looked as though they just had black pools where their eyes should be. Just two large patches of black. No other color at all. “We need a ride in your car,” one of them said to my husband. Mike, my husband, had actually turned his back to them to lock the car door. He hadn’t seen their eyes. That was so weird. Since when did teenagers call themselves young people? It was like two old men had jumped into these teenage bodies. As my husband, Mike, turned the boys started screaming. My husband was about to yell back when he saw their eyes. His face completely fell. I have never seen him so shocked by something. He side stepped away from them and moved onto the sidewalk. I moved to the back of our car. We both watched as these two boys suddenly started screaming and shouting. The two boys backed up still screaming and shouting. We turned around and headed into the restaurant. The doorman was standing inside the lobby. He hadn’t seen, or heard the boys. We had dinner, and I thought that would be the end of it. I remember feeling terrified for days after. I didn’t sleep very well, and had a lot of nightmares. I had a lot of headaches too. A week later and I was starting to dread going to bed as I would see these boys every single time I opened my eyes I was worried they would visit us again, or appear in our bedroom. I was scared to leave the house, and I felt violated—as though they had attacked me. Yet, all they had done was nothing compared to what others have gone through. They really didn’t do much except scream, shout and act weird. It was what happened to me afterwards that really bothered me. I really think that once you get caught up with these kids they have a long lasting effect on you. Nightmares, panic attacks, sleep-walking, headaches, fear of seeing them again. A few months later and things were starting to calm down. I asked my husband if he remembered the incident. He said he did and he had met up with them again. Apparently they were outside his office one afternoon waiting by his car. They did the same thing they did outside the restaurant. When my husband told them he was calling the police from his office the kids didn’t seem to care one way, or another. The creepiest thing was that they told him they wanted to go to an address to visit their friend who could help them. The address at the time didn’t mean anything—it was just a suburb of New Jersey. Years later we were moving house and when my husband saw the address of the house I wanted him to see he went white. It was the same address those boys had told him about outside of his office. What are these kids? What do they want? Some say they’re demons, others say they are lost spirits? I have no idea what they are—but they terrified the hell out of me. 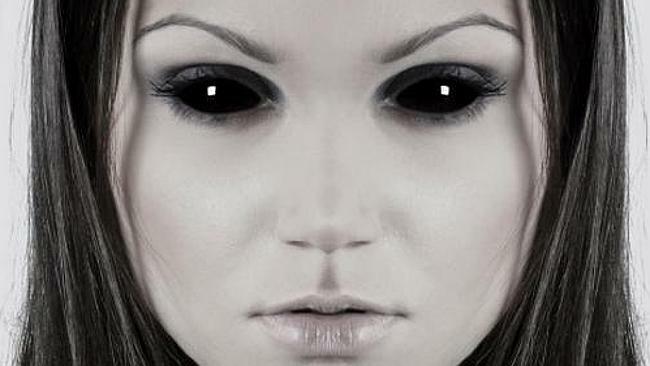 Have you had an encounter with the Black ~eyed Kids? – Why not submit it to the site? Home » Your True Encounters » Black Eyed Kids » “We Need A Ride” – Black Eyed Kids In New York!